For this purpose, we'd like to receive a variety of meaningful and valuable manuscripts concerning the subjects such as healthcare service respecting human beings and their lives, an ethical solution to artificial intelligent and Big Data, means of aiding and serving neglected people like the disabled or elderlies, mathematical theories that deeply affect science and industries, or the historical contents that would contribute to humanity in cultural aspect. For the last subject, one could write a manuscript about Jilin as it has been a historic city for many years in Asia history, for example. In other words, what we are seeking in this workshop is the novel and fresh (non-published) manuscripts in which various ideas are being integrated and fused. Participants may write about one of the subjects listed below but not limited to them. Energy Harvesting Business, Energy Harvesting Eonomy, Humanity et al. ***Author(s) MUST select topic as "HRH 2018" at the submssion system****. Recently, intelligent prediction, automatic recommendation and intelligent information visualization have been attracted attention in many application fields, as AI technologies have been evolved. The Workshop is mainly concerned with recent advances and challenges in the intelligent prediction, automatic recommendation and intelligent information visualization. With respect to tools and techniques, a special emphasis will be on modern artificial intelligence, computational intelligence calculi of uncertainty, data analysis, data mining and knowledge discovery, machine learning, information aggregation and fusion, multimedia information processing, Web technology and intelligence, cognitive and affective computing, multiagent systems, ontologies for intelligent systems, "big data" and Visualization, etc. For this purpose, we��d like to gather the manuscripts on the latest researches, projects, the industry trend related to intelligent prediction and visualization etc. ***Author(s) MUST select topic as "IPV 2018" at the submssion system****. In conjunction with CSA 2018, we will organize some workshops. 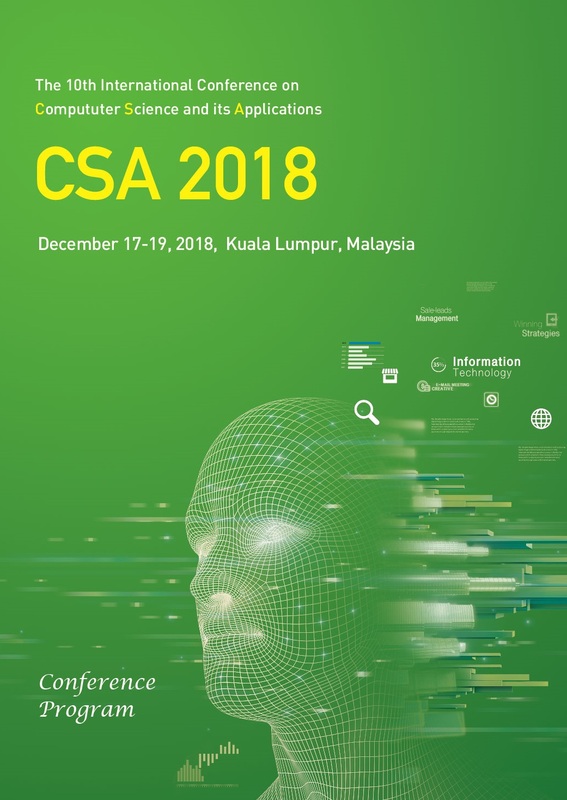 Several workshops will be held in conjunction with CSA 2018 with the aim to explore special topics and provide international forums for scientists, engineers, and computer users to exchange and share their experiences, new ideas, and research results on hot topics on Future Information Technology. Workshops for presenting papers from industrial companies and papers on implementations of systems and services are very welcome. All accepted papers will be published by Springer as Lecture Notes in Electrical Engineering (LNEE) Post-Proceedings (indexed by EI-Compendex and SCOPUS).